During the last ten days of 2015 we received eight inches of rain in my garden. We are not alone as heavy, often damaging rains have occurred over the US and in the UK. There were flood warnings out again yesterday, but the County has relaxed water restrictions, which may come in handy when summer comes. My garden is today like a super saturated sponge, but it has escaped flooding. On top of that, we have experienced unseasonably warm weather, but that may be past; there was ice on the bird bath this morning. I completed a walk around my spongy garden and will give a brief report as the old gardening year draws to a close and the new one…always a hopeful one…begins. It looks like some of the plants in my garden are as confused about all this strange weather as I am. I spied a water soaked bearded iris trying to hold up a fading yellow blossom and tons of ipheion, daylily, daffodil, muscari, and bluebell foliage poking up and looking quite healthy. Some critters are beginning to feast on some of that new foliage. There are scattered blooms on a camellia and azaleas. The pansies and violas are doing great. 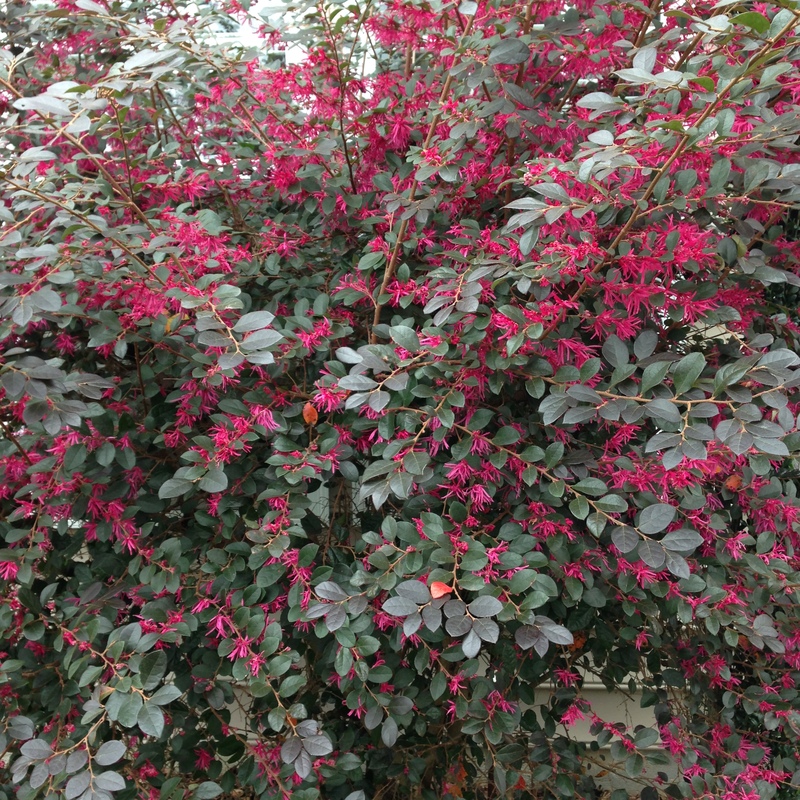 The warm weather has opened full blooms on the loropetalum. It is a blaze of color. I am not happy to see new foliage buds appearing on the Indian Hawthornes (Rhaphiolepsis indica). They are sure to be killed by the next hard frost. My hope is that there are secondary buds in hiding that will still leaf out in the spring. I am also concerned about our various boxwoods. All of them are putting out lush new foliage, and it will surely turn brown with frost. I can trim them in spring and they will be none the worse for it; they will just have to look a bit untidy until I can remove all the brown foliage. 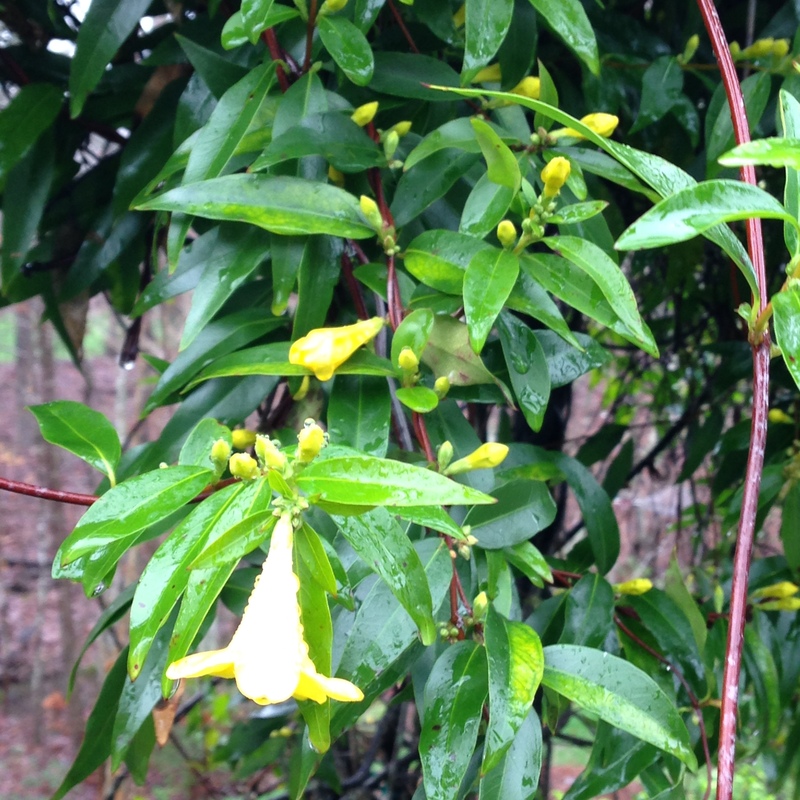 The Carolina jessamin (Gelsemium sempervirens) on the arbor is completely full of buds, some opening. This has been a hardy plant over the years, and I am hopeful that it will withstand the next frost. 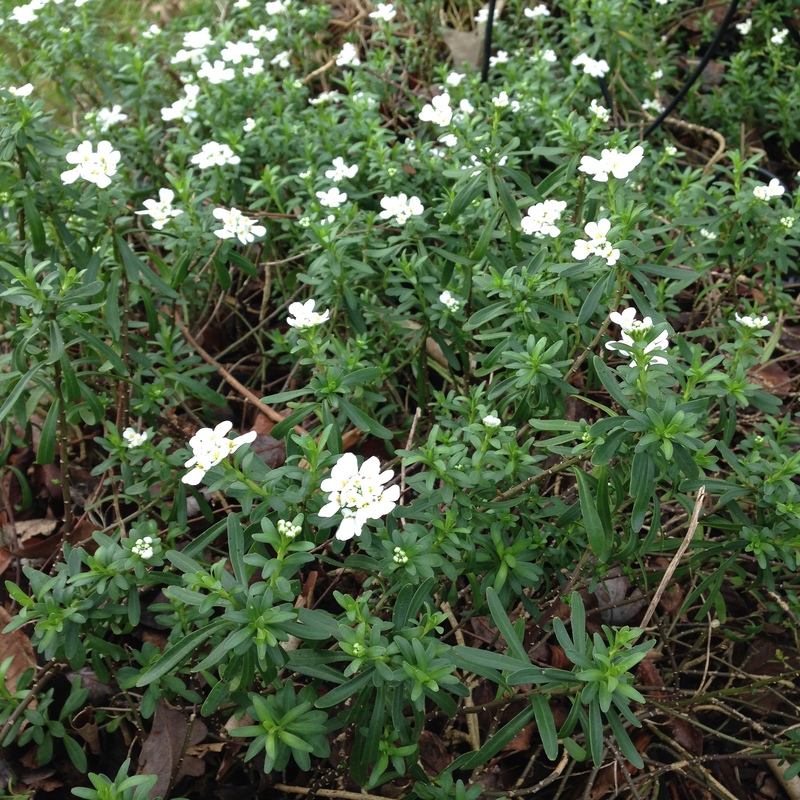 Probably the most surprising event of the new year is the early blooming of the candy tuft (Iberis sempervirens) some three months early. There are lots of dandelions. This entry was posted in Gardening and tagged azalea, bearded iris, bluebell, boxwood, Camellia, candytuft, Carolina jessamin, daffodil, dandelion, daylily, Gelsemium sempervirens, Iberis sempervirens Candytuft, Indian Hawthorne, ipheion, loropetalum. Bookmark the permalink. My beekeeper friend will be thrilled to hear about the dandelions! We’ve never tried dandelion tea, but perhaps…. Much the same here. In SC, this was the year of drought and deluge. The Upstate was parched at the end of summer and then had roughly 10 inches of rain each month in October, November, and December. We finished 10 inches above average for the year and the warm weather has prompted the bloom of many winter and spring-flowering plants. It will be interesting to see what is left for March and April. This is new territory for me, as I’m sure it is for many gardeners who have experienced these conditions. I do believe that if a plant lives, it will put out buds. We have floods round about with farm land under water where the river Clyst has burst its banks , but no where near as bad as further north in the UK. Your first photo is amazing, what a wonderful shrub! The loropetalum does look amazing John. I’ve spotted some dandelions blooming here also–lots of weeds in general, but it’s too wet to be in the garden right now. You are right, Susie. The nice weather tempted me, but I just can’t do much with all the water still in the ground. Bloom times are out of whack many places. 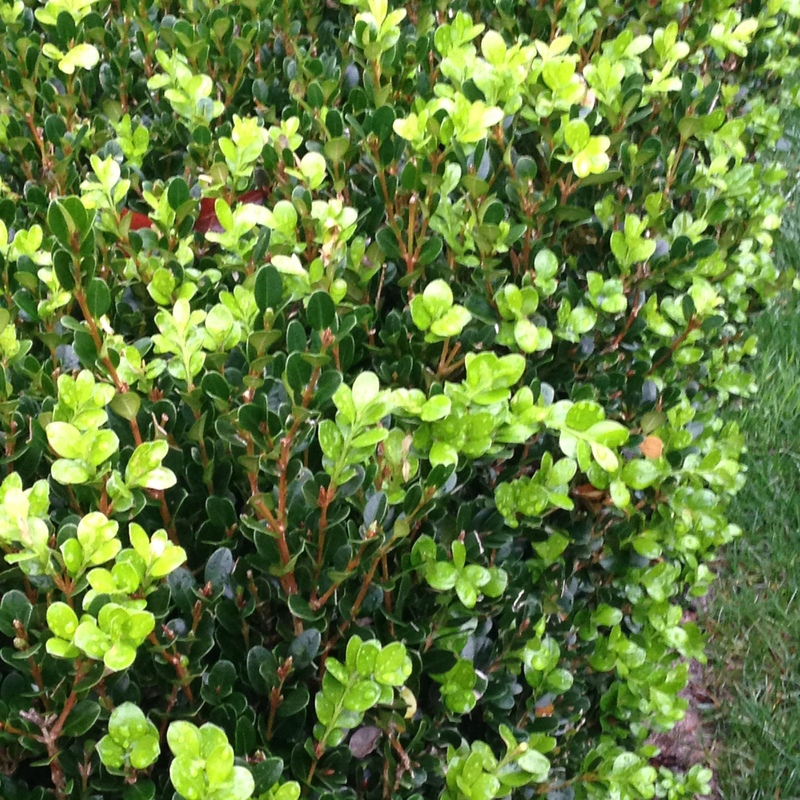 My boxwood like yours has all the tips brown and I did not rim late either. Next spring should be interesting. Yes, It will be fun to see how it turns out. I am optimistic. How odd. It’s going to be quite the winter and quite the waiting game to see how things turn out. The tough part is trying to predict how things will go in the spring. I guess we’ll just have to wait an see. How clever. All over the world, the weather and seasons seem to be quite topsy-turvy. While many people refute Global Warming, it must be said that there are definite changes in our weather patterns and there have been many hard hitting global disasters that are weather related. Personally, I do think we need to look at our we treat Mother Earth! Wishing you, your loved ones and your garden all the best for 2016! I agree with you. I am hoping my grandkids understand what they have to do.